1. 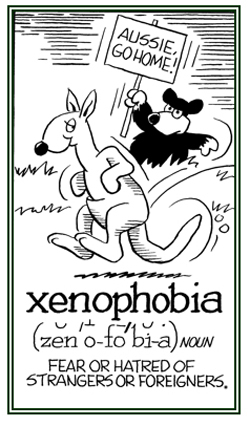 An irrational fear or hatred of being around foreigners or strangers and of unfamiliar situations: When people are possessed with xenophobias, they usually cannot tolerate having anything to do with others nor with situations that they have no knowledge of nor experiences with. 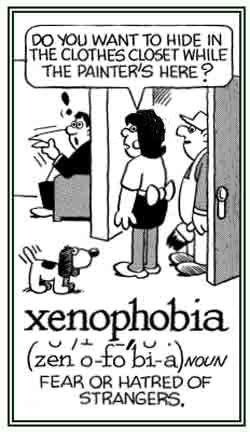 Xenophobias often involve dreads of things that are different from the normal habits or social environments of people who have such anxieties. 2. Etymology: from Greek xenos, "strange, foreign" + phobos), "fear, dread". © ALL rights are reserved.